Greetings from Butterflies & Blooms! I have great news for my fellow Lepidoptera enthusiasts! We have a very interesting new species in the exhibition. Meet Caligo atreus, also known as the yellow-edged owl, or our favorite: the magnificent owl. This blue beauty is in the genus known as the owl butterflies (Caligo). 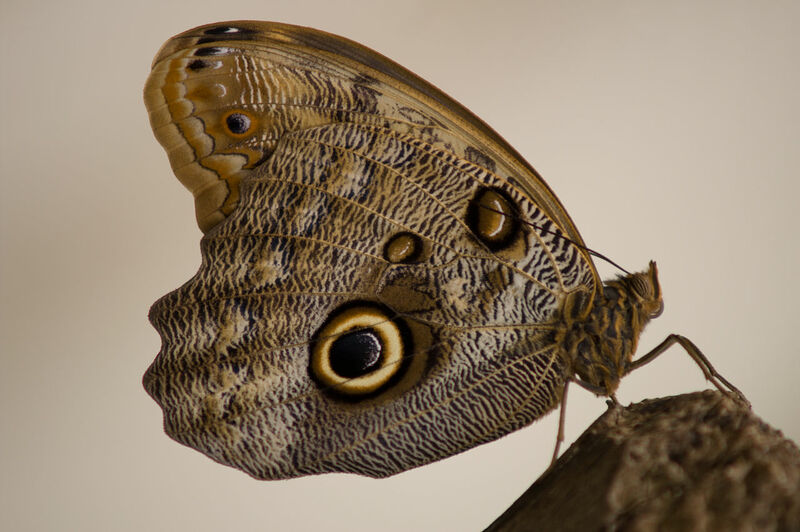 They’re called owl butterflies because the markings on the undersides of their wings have large black eyespots that resemble the eyes of an owl. (You will typically see the eyespots when the butterflies’ wings are closed.) This is thought to help them ward off predators. Caligo translates to “darkness,” which corresponds to the fact that they prefer to fly in the early morning before their predators are out and about. 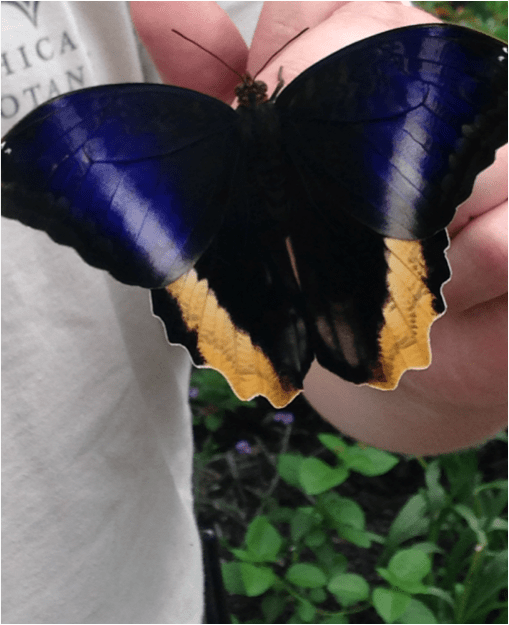 They are native to the tropical forests of Central and South America, and are among the world’s largest butterflies! We also have a few other species in the owl genus, including the giant owl and the forest owl. However, the magnificent owl is aptly named, as it is much more colorful than its peers—its dorsal side has deep blue striping on the top part of the wing and bright yellow on the bottom half of the wing. During most of the day, you can find them hanging out on the fruit trays or resting in the shade, but if you come early, you’ll have a good chance of catching these graceful giants dancing around the exhibition, showing off their beautiful coloration. Join us for our final week of Butterflies & Blooms, open through September 7. See you next season!